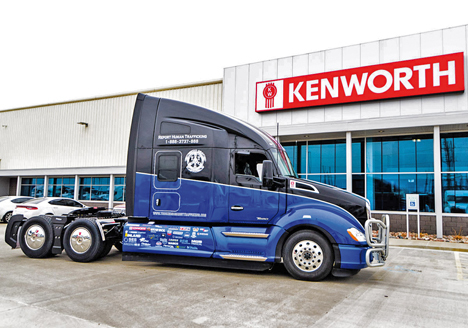 In an effort to further educate and fund efforts against human trafficking, Inland Kenworth has once again put together a special “Everyday Heroes” Kenworth T680 with a very distinctive paint scheme and signage. The project, in conjunction with Truckers Against Trafficking (TAT), has received significant support from platinum sponsors Kenworth Truck Company, Inland Kenworth and Ritchie Bros., along with other leading industry suppliers. Proceeds from the sale of the Kenworth T680, which has a retail value of US$162,000 ($215,000), will go directly to TAT – a non-profit organization devoted to stopping human trafficking by educating, mobilizing, and empowering the nation’s truck drivers and rest stop employees. “This started out as an idea in 2017 that got rolling, and it was a great success,” said Don Blake, who serves as new truck sales manager at Inland Kenworth – Phoenix, in Tolleson, Arizona. “Now, the sponsors we’ve worked with again are so supportive. It shows our industry’s true colors to pull together to raise money for a great cause. I’m especially appreciative to Kenworth. When I reached out to see if they would be a sponsor again, they were more than happy to help. Kenworth has been great to work with, and in 2019, the T680 will have its own booth at TMC and the Mid-America Trucking Show. Even with the auction still 5 months away, Mr. Blake is ahead of schedule with signing sponsors at different sponsorship levels that help build the T680. Providing support for the 2019 “Everyday Heroes” Kenworth T680 are Platinum Level: Kenworth Truck Company, Inland Kenworth and Ritchie Bros; Gold Level: PACCAR Engine, SEG Automotive, and Swift Charities; Silver Level: Bendix, Bridgestone, Eaton, FlowBelow, Horton, Jost, Meritor, PACCAR Financial, PACCAR Parts, PeopleNet, Utility Trailer Sales of Arizona, and WABCO; and Bronze Level: Alcoa, Arizona Rock Product Association, Arizona Trucking Association, Beaver Stripes and Molding, Chevron, ConMet, Davco, East Penn, Ex-Guard®, National Seats, PrePass / Help Inc, Sheppard, and Tectran. According to Kendis Paris, executive director of Truckers Against Trafficking, truckers are making a big difference. In the United States alone, profits from the crime of human trafficking are estimated to be worth $32 billion.